It might look like a steampunk creation, but Leon's Trithon Reyn TV is an actual product, inspired by the sets of yesteryear including the Philco Barber Pole with its swivelling and tilting CRT screen. 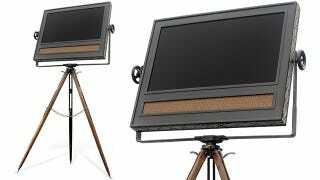 But the Trithon opts for a modern LCD display instead, perched atop an included eight foot tripod stand made from walnut wood with steel and brass hinges and fixtures. From the looks of that footprint you're going to need to dedicate a fairly large corner of your room to accommodate it.